Europe is hemorrhaging cash in deeply unsustainable projects like motorways, airports and gas infrastructure. If it seems too good to be true, it probably isn’t – a thought that inevitably comes to mind seeing the European Commission and the European Investment Bank congratulating themselves for the great job they’ve done. One and a half years after the launch of the European Fund for Strategic Investment (EFSI) – a three years initiative promoted by the Juncker Commission to catalyse new investments in Europe for EUR 315 billion – both institutions were eager to highlight investment sums facilitated through the fund and a few selected showcase projects. 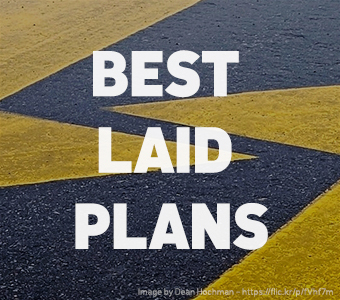 But on the eve of an extension of the Investment Plan for Europe up to 2020 and in particular in light of the EU’s climate commitment sealed in Paris , a closer look seemed necessary. Did the EFSI indeed keep its promise to not only trigger large investments, but support European decarbonisation and cohesion goals? A joint study by Bankwatch, WWF, Counter Balance and CAN Europe that’s being launched today, assesses in detail how much the EFSI has so far contributed to the EU’s climate agenda and what new investments have been made in regions which are lagging behind. Through an analysis of the 93 projects supported by the EFSI guarantee until July 2016 the study aims at comparing the fund’s performances to both its own announced objectives and to the broader EU’s climate goals. We’ve put together a short overview with highlights from the findings. But I want to take a closer look at the EFSI’s contribution to Europe’s climate goals. In relation to the Commission’s announcement that a large share of the EU’s financial resources is to be climate-related, the EFSI is supposed to mobilise additional investments in the real economy and align private investments with climate and resource efficiency objectives. This constitutes a unique opportunity to foster the much-needed change towards sustainable development in the EU. The EFSI portfolio shows a clear effort in encouraging renewables and energy efficiency projects, no doubt. Yet a concerning portion of the investments still supports fossil fuel projects. 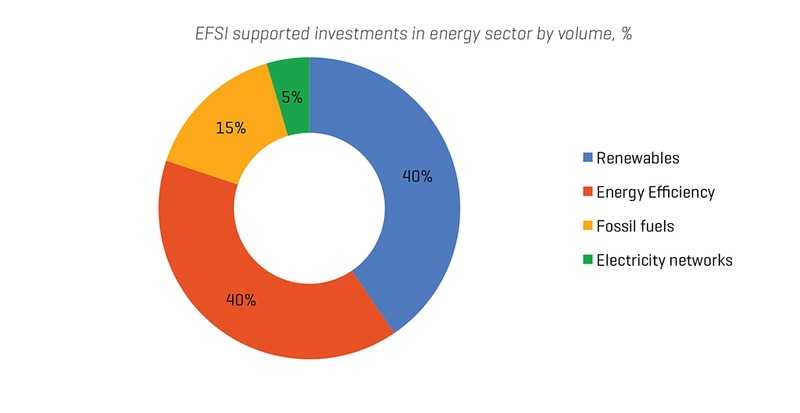 A worrisome 15 per cent of the EFSI energy sector support was related to gas infrastructure, mostly transmission and distribution adding up to EUR 1.5 billion investments into fossil fuel infrastructure. These investments target especially Italy, Spain and Germany, at a time when those countries have repeatedly made commitments to phase out fossil fuel subsidies and where renewable alternatives to gas can further be developed. These EFSI-supported gas infrastructure projects make gas more available and competitive and crowd out renewable energy projects and energy efficiency projects. To make sure the EFSI is not working against the EU’s long-term climate goals, more scrutiny is needed to assess whether projects are in line with the EU 2030 and 2050 climate and energy frameworks. At the same time, the Commission’s 2050 Energy Roadmap scenarios all show a decline of EU gas consumption in absolute terms, which increases the risk that gas infrastructure becomes a ‘stranded asset’. As a flagship initiative of the European Union, the EFSI should set a positive trend and clear fossil fuel projects off its agenda altogether. Renewables and energy efficiency, being more prominent in the EFSI’s energy portfolio, deserve scrutiny as well. Having green energy investments supported is by no means bad, but the question that needs to be asked is whether establishing the EFSI was really needed for it, or put differently, whether the EFSI provided and additional impetus for getting the investments off the ground. Since the creation of the EFSI, the EIB has not financed the energy sector with its existing portfolio to the same extent that it had in the past. This coincides with the high concentration of EFSI investments there. 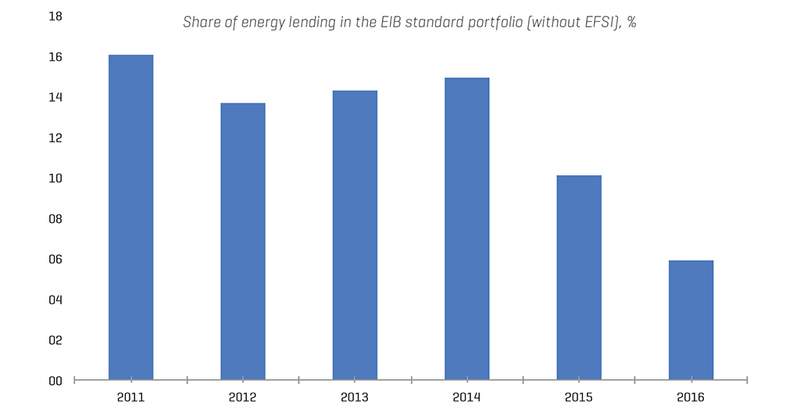 The significant drop in the EIB’s lending suggests that EFSI support may have replaced standard EIB energy lending instead of complementing it. This begs the question, was the EFSI at all necessary? On another note, the green lending distribution appears even less progressive if broken down into countries’ allocation. 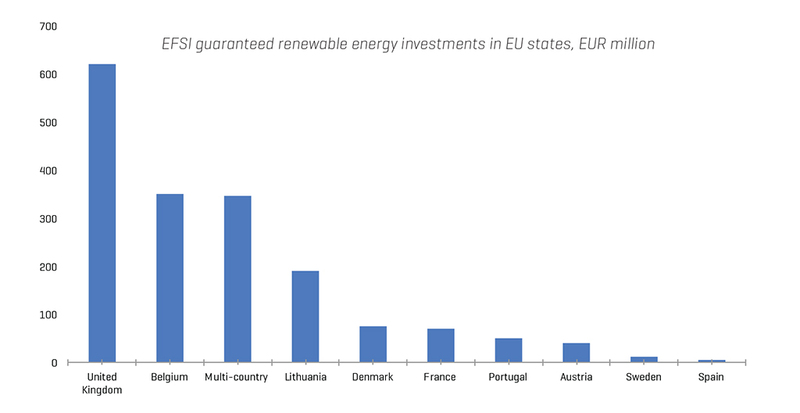 The positive trend towards renewable energy investments doesn’t match the EU’s cohesion goals, with the vast majority of such projects guaranteed by EFSI located in the UK and the remaining part still focused almost exclusively on EU15 countries, leaving most of the EU13 ones behind. If the EFSI is to play a constructive role in Europe’s decarbonisation and cohesion agendas, improvements in both the sectoral and geographical balance of investment, increased transparency, and a clear focus on genuinely sustainable projects are necessary. Find out more in our summary story and in the full report.